Amazon has Melissa & Doug products on sale today! I LOVE their products! The Lil Divas have tons of their products (& some more to come for Christmas!) They really make quality products that last and you can feel good knowing that they are learning & reinforcing crucial skills while playing. We have several puzzles, toys, stickers books, jumbo coloring books and other educational products from Melissa & Doug and really can only speak highly of them! 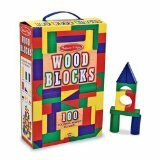 100 Colorful Wooden Blocks - These are small blocks in various shapes and the Lil Divas really enjoy building with them and then bringing in their smaller sized dolls to play. Lots of fun & imagination involved! Beginner Pattern Blocks $9.99 (it's 50% off today!) 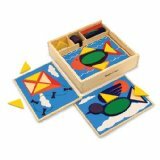 - This set features 10 brightly-painted wooden patterns and 30 colorful shape pieces to replicate the fun pictures. This a great tool to help reinforce colors, shapes and matching skills. Pieces include a fish, dog, butterfly, flowers, bird, and fire engine. Great early math skills play!!! 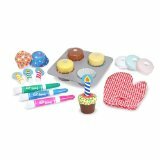 Bake & Decorate Cupcake Set - everything a child needs to play pastry chef. Kids decorate the 4 cupcakes with icing markers (included), a cloth oven mitt, plastic muffin tray, and paper cupcake sleeves. Cutting Food Box - $9.99 (it's 50% off today!) Over 30 Hand-Painted wooden Pieces which Include a knife and cutting board! Kids play while reinforcing fine motor skills and hand-eye coordination. It also encourages imaginative play and of course various math skills - just think of the fraction lessons!!! 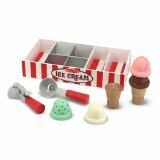 Deluxe Ice Cream Parlor Set - $14.99 (50% off today!) lets children make believe they're running an ice cream shop. The play set comes with 4 stackable ice cream scoops, two wooden cones, and two scoopers. 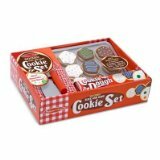 Slice & Bake Cookie Set - lets children pretend to bake, decorate, and serve cookies. Great for practicing fine motor skills, math concepts, and imaginative play. 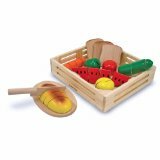 The set includes 12 wooden cookies, 12 wooden decorating pieces, and toy utensils. 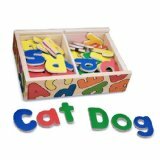 Wooden Magnetic Letters - 52 piece set includes upper & lower case letters! I just bought these along with a tabletop magnetic board & can't wait to use them! Great for letter recognition, beginning spelling, etc!! 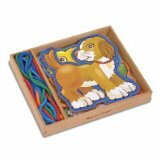 Lace & Trace Pets five jumbo, double-sided lacing panels, plus five color-coordinated laces come in a wooden case. Great to reinforce hand/eye coordination, fine motor, cognitive and visual perception skills. This one was on our Christmas list! The girls love lacing at school and I wanted to get a set for home! Sticker Books - I bought a few of these last summer (along with some of their jumbo coloring books - those are great too!) and they were a huge hit!! The girls are still playing with them months later. Tons & Tons of stickers - literally hundreds of stickers arranged in themed pages. The girls love making scenes out of these and can sit & spend quite a bit of time arranging things just so and making up stories to go along with their finished scenes!